Gourmet Deviled Eggs with Speck Ham and Roasted Red Pepper is an elegant spin on the traditional recipe. This recipe jazzes up the traditional deviled eggs by integrating Speck Ham and roasted red pepper.Serve these delectable little Gourmet Deviled Eggs with Speck Ham and Roasted Red Pepper at your next dinner party and watch how fast they will quickly disappear. My family loves Deviled Eggs. I have to make them at every big party (Kids Parties & Adult Parties) and often at our family gatherings. They are easy, low carb, filling, cheap, and delicious!! My Halloween Spider Deviled Eggs are a HUGE hit every year for Halloween. I was approached by Speck Ham to try their product for free and give my honest opinion. I absolutely LOVED IT! I was almost greedy and didn’t want to share… But what is the fun of trying something amazing and not sharing the experience? If you are a serious foodie then you must try this ham!!! Speck Ham or Speck Alto Adige PGI is a distinctive little smoked ham is made in South Tyrol, located in the Northern part of Italy. 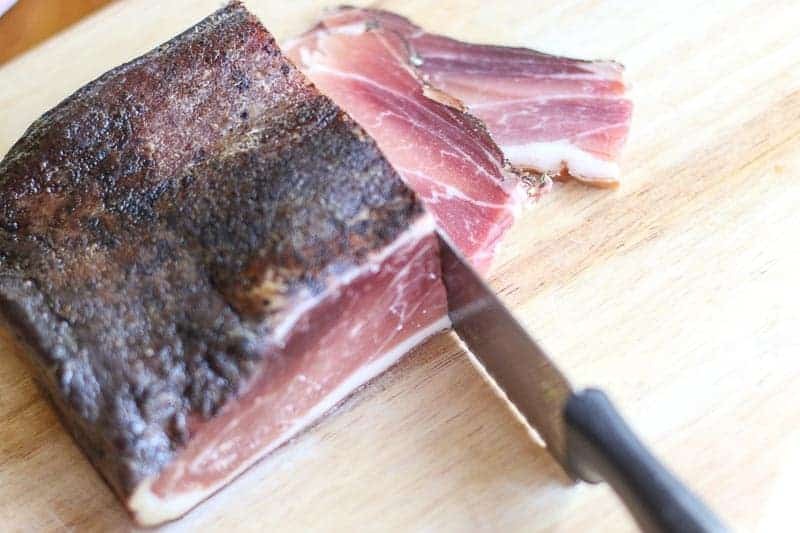 It is similar in taste to a proscuitto or a pancetta with a more intense smokey flavor. I knew it would be absolutely perfect on Deviled Eggs. Rather than using the traditional relish in Southern Deviled Eggs, I incorporated finely chopped roasted red pepper. The saltiness of the Speck Ham and the sweetness of the roasted red pepper turned these eggs into a Gourmet Gourmet Deviled Eggs treat! Not only do they taste fabulous, but look how pretty! Fancy, smancy little Deviled Eggs, huh? Garnish with little slivers of green chives and you have a party hit. My Gourmet Deviled Eggs with Speck Ham and Roasted Red Pepper disappeared in minutes. Thank goodness I tried one before they disappeared!! Guess I will have to go and make them again…. Woe is me!! For more party favorites, check out Dill Pickle Dip, Roasted Brussels Sprouts with Speck Ham and Balsamic Glaze, Spanish Garlic Shrimp. If you would like to learn more about Speck Ham or Speck Alto Adige P.G.I. check out there website here. I promise you will love it, and when you do, I told you so! Gourmet Deviled Eggs with Speck Ham and Roasted Red Pepper is an elegant spin on the traditional recipe. This recipe jazzes up the traditional deviled eggs by integrating Speck Ham and roasted red pepper.Serve these at your next dinner party and watch how fast they will quickly disappear. Cut hard-boiled eggs in half lengthwise. Scoop out yolk and add yolk to a seperate bowl. Mash yolk, and mix in mayonnaise, mustard, salt and pepper and until smooth. Add in roasted red pepper and mix well. Spoon yolk mixture back into each empty egg. Slice thin strips of Speck Ham and add to each egg. Now who wouldn’t like to have these! They just look tempting especially with the addition of ham- YUM! Just lovely! The speck is a nice touch! And the roasted peppers give it a wonderful color! These are stunning! I’m not normally a huge fan of deviled eggs, but these ones look like they pack a lot of flavor! Nice new spin on the traditional deviled eggs. Oh Katie these look AMAZING! I was sold at Devils Eggs but you`ve taken them to a whole new level here! Can`t wait to try them! Thanks so much for the awesome recipes!